Chris Hein’s popular horn, wind, guitar and bass collections are some of the most deeply sampled products on the market and show a remarkable eye for musical detail. 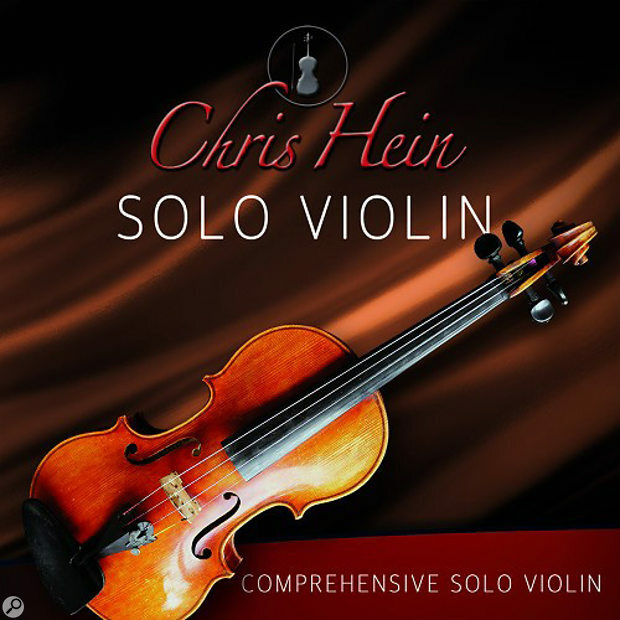 The veteran producer has now released Chris Hein Solo Violin, a 2.73GB instrument which runs on the free Kontakt Player (included with the library) and the full version of Kontakt 5. The myriad subtle, variable, mobile and expressive elements that make up a violin’s sound are a challenge to replicate with samples, but I’m happy to say this library is equal to the task. For a start, there are 12 different types of short notes (aka ‘note heads’) ranging from a second in length to a short spiccato, which can be used alone or layered over a long note as an initial bow attack. You can switch between them on the fly using MIDI CC commands, creating organic, natural and realistic bowing variations. Vibrato has been thoroughly nailed: use the mod wheel to activate a real-sounding vibrato with controls for speed, depth and tuning, or specify your own auto-vibrato curves which kick in automatically. There’s also a ‘hot key’ which can be tapped in real time to impart a vibrato-like pitch wobble, arguably not 100 percent lifelike but close enough for jazz. This library uses the industry-standard, monophonic ‘true legato’ technique to generate real played intervals (utilising my preferred VSL-style protocol for superimposed notes), along with an artificial legato engine which performs additional smoothing and blending. There are three legato modes: ‘short’ for fingered note changes, ‘long’ for portamento glides (activated with the sustain pedal) and a so-called ‘glide mode’: this inserts notes within your played intervals, creating a fluent run in a scale of your choice, and can also produce exciting ‘rip’ effects. The legatos play like a dream, making it easy to perform fast or slow joined-up melodies, manically fast trills or Stéphane Grappelli-style jazzy runs. A wealth of played articulations includes tremolo, pizzicato, ponticello, flautando, harmonics, col legno, ricochets, repetitions, falls, doits (amusingly mispronounced ‘dwahs’ in the walkthrough video), chromatic up and down runs, effects and some terrific, cartoon-like glissando slides, all played with great panache and animation by violinist Naomi Binder. Each style may be assigned a keyswitch or playable hot key, so you can trigger (say) a fall at the end of a melody line. Other useful features include a virtual ensemble mode, convolution reverb and on-board effects. Smooth cross-fading between the violin’s six dynamic layers has been achieved by a fiendish sample phase-align process, while a ‘Mrs Melodyne’ is credited in the pdf manual; all this means you won’t hear any nasty phasing artefacts or out-of-tune samples. Should you feel the urge, deep editing facilities are available for every parameter under the sun, but personally I’d rather get on with playing this excellent, supremely adaptable instrument.